As visitors to our tasting room know,we love to joke around at the winery, but we take our winemaking very seriously. The results are delicious and award winning! De La Montanya has been producing since 2000. Grapes are hand-selected from 270 acres of estate vineyards in the Sonoma Coast, Russian River Valley, Dry Creek Valley, Alexander Valley, North Coast, and Lake County, and crafted into exquisite, very limited production wines that reflect the classic characteristics of each varietal. 2017 Rose of Pinot Meunier "Christine's Vineyard"
2014 Pinot Noir "Tina's Vineyard"
2015 Pinot Noir "Calandrelli Vineyard"
2015 Pinot Noir "Christine's Vineyard"
2016 Pinot Meunier, "Christine's Vineyard"
2016 Primitivo "Felta Creek Vineyard"
2015 "1906" Late Harvest Zinfandel "Felta Creek Vineyard"
Just released: "Better red than dead", limited edition Twisted Merlot with Dee Snider of rock band Twisted Sister. $36 retail/members $29. Available here. We're proud to team up with SSU for the release of Rockforce Red - a limited edition wine dedicated to Coach John Goelz on his 1,000th win. Proceeds of this wine benefit the SSU Baseball Program. $28 retail. Available here. Get to know Finale Wines! 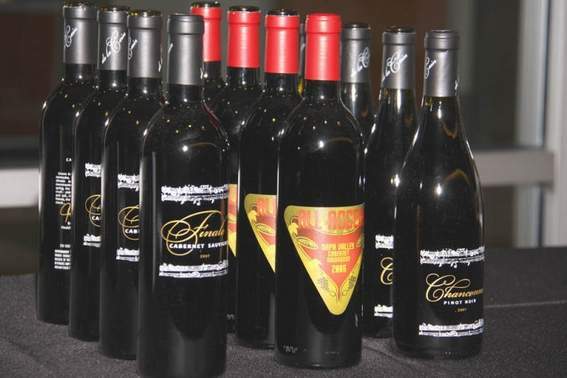 Our wine project with Journey's Jonathan Cain is a huge hit across the country. Check out the latest releases.